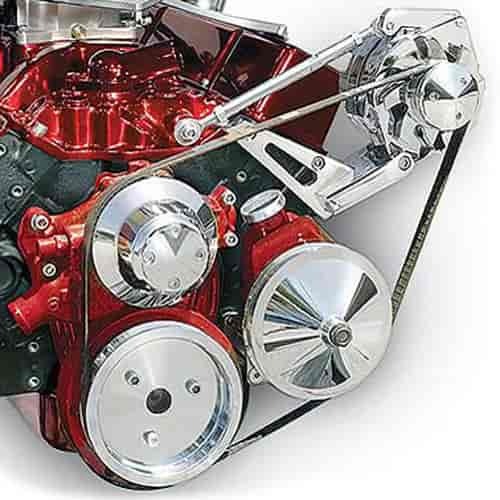 March Chevy Small Block Deluxe Outward Mount Serpentine Kits replace your low performance V-belts, pulleys, brackets and eliminate any issues with belt throwing. Complete and simple to bolt on. Outward mount kits locate your alternator and A/C outside the engine outline and back towards the cylinder heads, ideal for engine compartments with minimal engine to radiator clearance. The "Deluxe" kits feature the original style mounting brackets that are precision CNC-machined from solid billet 6061-T6 aluminum to fit perfectly as well as handle high torque and vibration. The high tensile strength of the material combined with the hard coating on all high wear areas means a much longer duty life than common cast pulleys with no chance of any type of fracturing or structural failure. All pulleys and brackets have a "No Polishing" maintenance-free clear powdercoating. An adjustable stainless steel tensioning rod with chrome-moly rod ends and mounting hardware is also included. There are two pulley ratios available; Performance to increase horsepower by reducing accessory drag, with typical gains of 12-15 horsepower at the rear wheels and High Waterflow to increase cooling by speeding up water flow and fan speed, critical for low speed driving where most overheating occurs. Gates K060539 - Micro v belts 54 1/2"